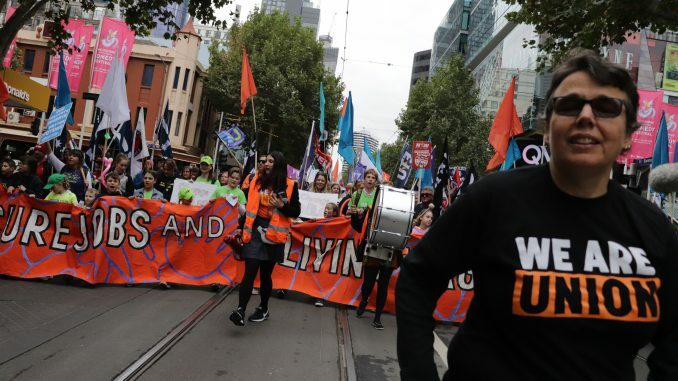 Tens of thousands of workers have taken to the streets, marching through Carlton and Melbourne’s CBD to highlight job security and fair wages issues. The protest was organised as part of the ‘Change the Rules’ campaign led by the Australian Council of Trade Unions (ACTU), who was joined by a number of other trade union groups showing their support for the movement. Richard Bradley, a health and safety representative for the CFMMEU (Construction Forestry Maritime Mining Energy Union), was helping to marshal the event. As they marched, protesters held a banner a reading “secure jobs and a living wage” while others pounded drums and chanted slogans such as “union power” and “change the rules”. The rally then halted at the steps of parliament as National Secretary of the CFMMEU Michael O’ Connor gave the crowd a fiery speech which began by calling out the Australian Building and Construction Commission (ABBC). Similar marches took place in Adelaide, Hobart and regional Queensland, but this was the second protest to take place in Melbourne this week, following the illegal protest by animal rights activists that shut down the city centre on Tuesday. Organisers say the Change the Rules rally was planned months in advance in coordination with police, ensuring it took place outside of peak hour to minimise congestion.